Apollo I is chemically pre-tuned from the factory and sealed in Galaxy's new air tight vacuum packaging. The rubber is designed for Forhand, it`s tacky and with very good control and extreme spin. 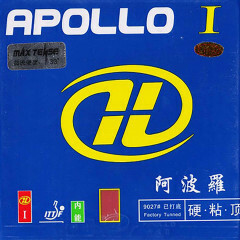 Apollo I creates a perfect arc plus extra-sharp strokes on the ball. The sponge is medium. Milky Way/Yinhe Rubber Apollo Medium is beeing added to cart.